A versatile front-end for recording that both sounds good and is easy to use. Full processing chain in one box. Ease of use. Single Air Band knob for top-end tweaks. JZ Microphones produces a range of mics that can, of course, be used with a preamp of your choice but it has other ideas and now it's introduced its own preamp (a full channel strip, in fact) to perfectly match its microphones and complement their characteristics, although it can be used with any mic or plugged instrument. The JZ Track is made by SPL in Germany to JZ Microphones' specifications and appears to be a modified version of SPL's own Track One unit. What you get is a single rackspace unit that provides mic (XLR) and instrument/line (1/4-inch jack inputs) feeding a de-esser, compressor/limiter and a three-band EQ, all with individual bypass switches. The unit can be used on its own as a complete mono recording channel or can be linked with a second JZ Track compressor for stereo operation. Outputs are available on XLR and 1/4-inch jack but it's also possible to buy an optional AD Card with ADAT and SPDIF outputs. The JZ Track is logically laid out and easy to set up. First on the panel is the input gain knob and then you get three illuminated switches, two of which change the impedance of the jack input for instrument or line operation and switch on 48v phantom power for the mic input. 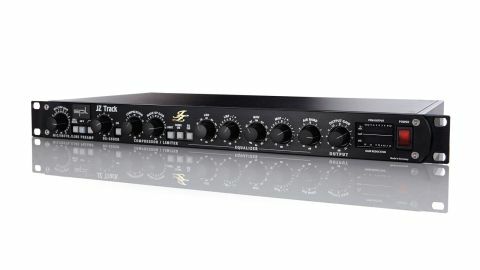 "There's no point splashing out on an expensive mic if you don't have anything decent to plug it into, which is where a standalone channel strip comes in"
The third engages a hi-pass filter that, using a 12dB/octave slope, reduces the low-end below 50Hz, ensuring unwanted rumble is minimised while leaving wanted vocal frequencies intact. Next up in the chain comes the de-esser which is linked to an LED that flashes when sibilance is detected. This is a single-knob operation that uses a phase cancellation technique which successfully focuses on just the frequencies where the 's' sounds live without messing with the rest of the sound. It's easily done and the results are unobtrusive - if sibilance is a problem, you can simply turn up the knob until it's sufficiently reduced. The compressor is also a bit of a no-brainer as it just has two knobs - Compression and Make-Up Gain - the attack and release being automatically adjusted in response to the input signal. The amount of gain reduction is clearly shown in a bargraph display at the far right of the front panel, and, with soft knee operation, the compressor provides pretty transparent and smooth processing that can add consistency and a useful degree of thickening to the source material. If you want to keep a tighter grip on levels, a switch will change over the operation of the section to a very functional limiting, with the Compression knob setting the threshold. Bringing in the EQ, your first band is a semi-parametric filter with up to 14dB of cut or boost across a frequency range that runs from 30Hz to 700Hz, amply covering bass and the lower mid range. Setting up is dead easy - choose a frequency with the first knob and boost or attenuate it with the centre-detented second knob. The same principle applies to the second band which offers up to 12dB of cut or boost between 680Hz and 15kHz. The third band offers single knob control of the 'air' frequencies with up to 10dB of cut or boost at a centre frequency of 17.5kHz. Between the three bands there's an impressive range of sweetening on offer, and we particularly liked the Air Band for subtly enhancing the top-end. There's little point splashing out on an expensive mic if you don't have anything decent to plug it into, which is where a standalone channel strip like this comes in and, with its naturally transparent sound, easy operation and plenty of dynamic and tonal control, the JZ Track does the tracking job very nicely indeed. Also, if you are willing and able to incorporate hardware into your system when mixing, the line inputs and outputs on the JZ Track allow it to function as a very practical processing tool.